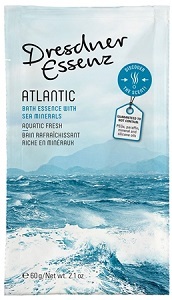 Dresdner Essenz Atlantic (Sea Minerals) Bath Essence has an aquatic scent that refreshes and temporarily satisfies your longing for a holiday by the sea. It is formulated with Menthol and the natural essential oils of Spearmint and Eucalyptus that invigorate the spirit and activate the body. An intensive skin care complex using Sea Salt, Sunflower Oil and Panthenol produces a gentle nourishing foam that noticably pampers the skin and keeps it from drying out. It contains no PEG emulsifiers, paraffins, mineral oils or silicone oils. Each 60g sachet is good for one bath.